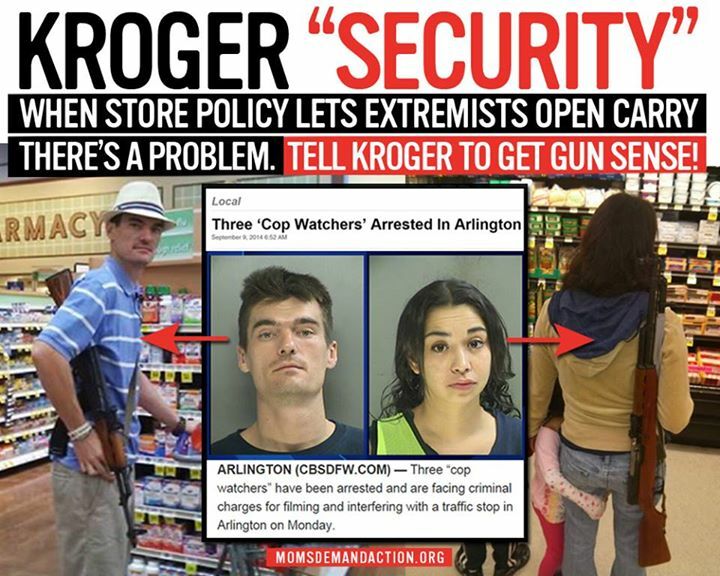 Following an arrest of two Texas open carry advocates earlier this week, a gun control group is using their mugshots in an ongoing campaign to influence a large grocery store chain change their gun policy. 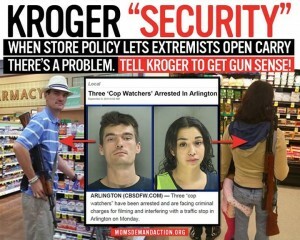 This however, is not stopping Bloomberg-backed Moms Demand Action for Gun Sense in America from using the mug shots of the Watkins and Lucero in their Kroger ad campaign, although the pair was neither arrested for crimes stemming from open carry activities, nor at a Kroger. “Tell Kroger we don’t need this kind of protection,” reads a statement posted to the MDA social media account late Wednesday. The post is accompanied by a graphic displaying the mug shots of Watkins and Lucero superimposed over a file image of what appears to be the couple open carrying inside a grocery store. The Moms group in recent weeks has set the grocery store chain in its sights, pushing for the giant, which owns 17 brands that are responsible for $98.4 billion in sales in fiscal 2013 to “make a clear statement that the open carry of firearms is not welcome in its stores.” The group has made a name for itself in challenging corporations ranging from Target to Chipolte and most recently Panera Bread through social media campaigns to make changes to their firearms policies. For his part, Watkins, who is the coordinator and a legal figurehead for Open Carry Tarrant, which was once part of Open Carry Texas, is not impressed with the latest salvo from gun control group. Watkins contends that the arrest, which generated the mugshots, was spurious. Guns.com contacted MDA for comment, but did not receive a response in time for publication.